Bestowed with an ingenious team of designers and advanced production unit, we have been able to introduce an exclusive range of Cable Tie Gun. The offered gun is manufactured by our ingenious professionals using quality-assured components and modern methodology in conformance with international quality standards. 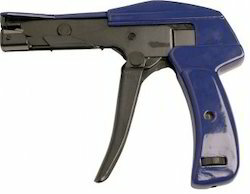 Provided gun is designed for the precise stamping over a wide array of media such as leather, paper and plastic. In addition to this, clients can avail this gun at negotiable prices from us. They can be used with ties of thickness 1.3-2,3mm & width of 2.4 to 9.5mm. Available with stop guide mechanism to avoid injury, wider mouth for wider cable ties. Our organization takes pleasure to introduce its business as one of the leading entity offering UV Cable Ties. This cable is designed and manufactured under the stern guidance of our adroit professionals using premium quality components and sophisticated techniques. The cable finds wide applications during the various kinds of electricity usage. Also, this cable is made available for clients in several technical specifications to meet their precise needs. Further, clients can avail this cable at industry leading prices. 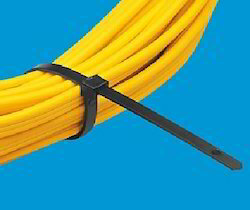 Available in both White & Black these all weather cable ties are quick & economical replacement for SS Cable ties. They do not corrode or lose their shape even after 4-6 years when subjected to high temperature, rain & UV. Unlike SS ties where there is a risk of shock when in contact with naked wires, these ties are safe & usually have a shelf life of 4-8 years. Looking for Cable Ties ?